After a less than stellar debut outing that resulted in the Mets’ only loss of the season thus far, Steven Matz returned to the mound Saturday looking like a man with something to prove. The Mets sent Matz out to face Nationals left-hander Gio Gonzalez, who’s enjoyed a great deal of success against the Mets since he was traded to Washington. According to Mark Simon of Baseball Info Solutions, Gonzalez had a 2.39 ERA in his last 11 starts against the Mets, holding them to two runs or fewer in 10 of those 11 starts. Saturday was more of the same for Gonzalez, as he limited the Mets to one run on six hits in 5.1 innings of work. On the other side of the diamond, Matz was nothing short of brilliant in his second start of the season. The 26-year-old oft-injured left-hander struck out eight Nationals over five scoreless innings on the afternoon, limiting Washington to only three hits and two walks. Matz’s command was much improved on Saturday, which allowed him to get ahead of 13 of the 20 Nationals batters he faced. After the Mets squandered an opportunity to put a run on the board in the first, Matz allowed speedster Trea Turner to reach on a bunt single to open up the bottom of the frame. Turner went on to steal second, one of five stolen bases for Washington on the afternoon, and the Nationals looked primed to jump out to an early lead. The Nationals had Anthony Rendon, Bryce Harper and Ryan Zimmerman coming up next, making it almost a foregone conclusion that the Mets would be facing an early deficit in this one. In a twist that absolutely no one saw coming (if you did, I commend you on your optimism for which I do not share) Matz would go on to strike out all three Nationals to keep the game scoreless. The southpaw was working almost exclusively with his fastball, which was sitting 92-94 for the afternoon, and his sinker in the first, somehow escaping a potentially disastrous inning. The Mets failed to get anything going in the top half of the second, and Matz returned on the mound hungry for more. After striking out Howie Kendrick and Michael A. Taylor to make it five straight strikeouts, he walked Brian Goodwin after getting ahead of him 0-2. Pedro Severino was up next for the Nationals, working another 3-2 count and eventually taking a fastball down in the zone to center field for a single. Knowing that runs were going to be hard to come by, the Nationals sent Goodwin all the way from first to home in an attempt to jump out to a 1-0 lead. Juan Lagares was not going to let that happen on his watch though, throwing an absolute laser to Travis d’Arnaud in time to get Goodwin and keep the game scoreless. Neither team could get anything going until the bottom of the fifth, as Taylor reached on a throwing error by Todd Frazier to start the inning. The Nationals chose to have Goodwin lay down a sacrifice bunt, moving Taylor into scoring position with one out. With Severino up at the dish with a man in scoring position, Taylor stole third and scored easily on a single to right to put the Nationals up 1-0. The unearned run would be all the Nationals got off of Matz though, as Mickey Callaway chose to go to everyone’s favorite high leverage reliever Hansel Robles to start the sixth. 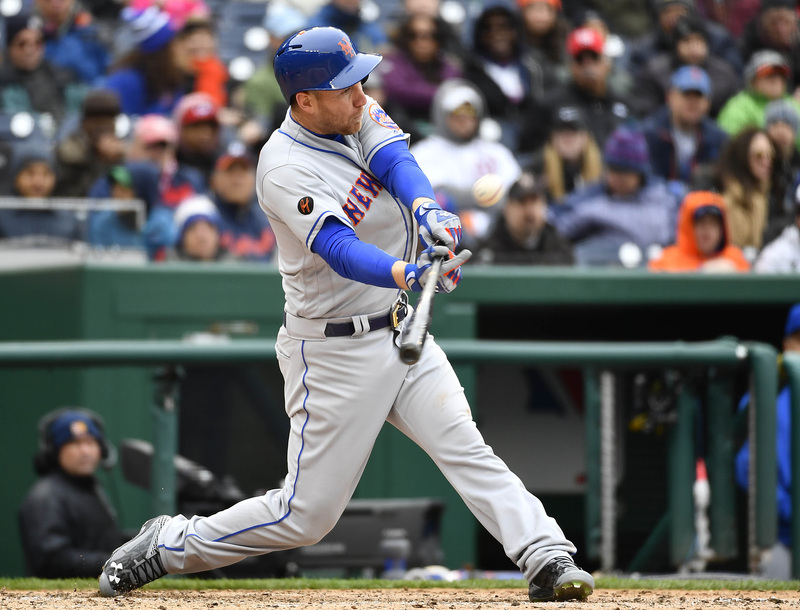 After a Wilmer Flores ground out to third, Frazier delivered a double to deep right to set the Mets up in scoring position in the sixth. d’Arnaud knocked a single to center, scoring Frazier and tying things up at 1 apiece. Jay Bruce was up next, and hit a single to right, setting the Mets up with first and second with one out. The Nationals then made a pitching change, bringing in Matt Grace to relieve Gonzalez, and he secured the final two outs of the inning. Callaway turned to the aforementioned Robles in the bottom half of the inning, who immediately surrendered a solo home run to Bryce Harper that put the Nationals back on top by one. Interestingly, Callaway stuck with Robles, who let up one more hit before he struck out Goodwin to end the inning. In Callaway’s defense, he got sucked into Robles’ good start to the season just like the rest of us. Robles will need to earn his manager’s trust back, and it’s unlikely he gets more high leverage opportunities until he proves he’s up to the task again. The Mets bats came alive in the top of the seventh though, as Amed Rosario hit a leadoff single to get things going. Asdrubal Cabrera stepped up to the plate and delivered an RBI double to deep right, scoring Rosario and tying things back up. The savvy veteran was able to advance to third on a Yoenis Cespedes groundout and eventually scored on a Frazier groundout to second. Frazier’s RBI groundout proved to be the decisive run, as both teams failed to score the rest of the way. Mickey Callaway brought Jeurys Familia in for the five-out save, and he somewhat shockingly got all five outs without any theatrics. The Mets are now the winners of four straight and have started a season 6-1 for the first time since 2006. Of course, the Mets finished first in the NL East in 2006 with a 97-65 record, dropping game seven of the NLCS to the St. Louis Cardinals. That team also won their fifth, sixth, and seventh game of that season in a sweep of the Nationals in Washington. The 2018 Mets are looking to do the same, and they take on the Nationals in the final game of the series tonight at 8:08, as Matt Harvey (0-0, 0.00) faces Tanner Roark (1-0, 1.29).